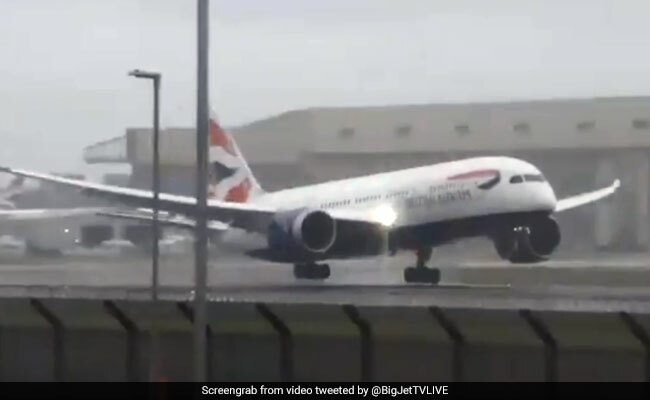 A British Airways aircraft flying from Hyderabad to London's Heathrow Airport aborted a landing attempt seconds after touching down on the runway, only to go back up in the air again. The incident happened over the gusty winds that have hit Heathrow, reports said. A heart-stopping video of the aborted landing of the plane swaying in the winds has taken social media by storm, with people praising the pilot's skill. A clip of the 'TOGA', or Take Off/Go Around, shared on Twitter has already garnered over 2.9 million views. "Well done pilot!" Big Jet TV said. Twitter users admired the pilot for handling the incident. "Excellent response by professional pilots," Elizabeth Pyper, a user on the micro-blogging site, said. The flight British Airways 276 that took off from Hyderabad's Rajiv Gandhi International Airport arrived at London Heathrow on Friday after a delay of 18 minutes, according to flight tracking website FlightAware.